Keep in touch with new ideas and new tools! Moderated email announcements, concise, and timely. We never share your email address. Bristol airport (detail) © Copyright 2005 by Andrew Eason. Reproduced by permission of the artist. Airports are fine places to sketch. Even if you seldom draw people, and even if you aren't very good at it, drawing in airports can help you improve the moment while waiting for your flight, while polishing a useful skill and helping you to preserve the memory of your trip. If you're waiting for your flight -- especially if you're facing a delay -- you aren't going anywhere. You probably don't want to unpack your laptop computer -- you'll need the battery for the flight. You don't want to read -- you'll need your book for the flight. Take out your notebook and draw a quick sketch of the people around you, and of the place. Being able to sketch a place quickly is another way of making a note about it. It's a nice skill to have -- not least because it leads you to think about what you're seeing, and how it differs from what you see every day. Remember: your notes are for you: it doesn't matter if they are beautiful or well drawn, any more than your penmanship matters. If you can read your notes, that's what matters. Ten years from now, those horrible sketches you make today will look a lot nicer! The big international crossroads -- Heathrow in London, Changi in Singapore -- give you a chance to see people from the far corners of the world, sitting and waiting (like you) for their flights. But small, regional airports offer equally good sketching: you see a lot more cowboys and mining engineers in College Station, Texas, than you're likely to see back home in Boston. You can't wander around, because your flight might leave. Neither can your fellow passengers. Everyone is tired. Everyone is stuck. 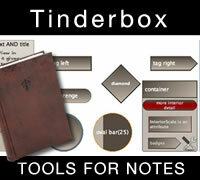 This is great for sketching, because you've got time to draw. 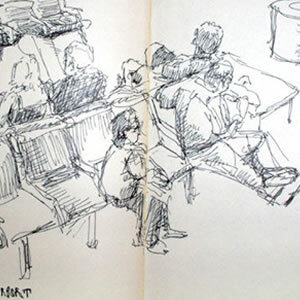 People seldom notice you if you sketch in airports. (In art museums, everyone comes and checks your work and judges it against the masters. In airports, they leave you alone.) Even if people notice that you're sketching them, they seldom mind. If they do, they can simply change seats -- no hassle for them, no embarrassment for you. This is safer, in fact, than café sketching; there's always a chance that people meeting in a café are meeting there because their friends or spouses won't know, but nobody sneaks off to the airport. © Copyright 2005-2010 by Eastgate Systems, Inc. All Rights Reserved.